Sautee onions and garlic in olive oil until they start to soften. 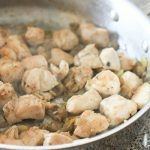 Add chicken to pan and cook until it starts to brown. Add can of green chilies to pan and cook about another minute. Add enchilada sauce, chicken broth, and pasta to the pan. Bring mixture to a boil, then cover and reduce heat to low. Let pan simmer, covered for 15-20 minutes until pasta is tender. Remove pan from heat and stir in sour cream. Top with shredded jack cheese. Stir in cheese until melted, or top and heat under broiler until melted. Just a minute or so. Optional - Sprinkle with freshly chopped cilantro.